The government today kept its promise to publish more details of the apprenticeship levy operating model — but sector leaders warned it raised “more questions than it answers”. The online document was criticised for lacking detail by the Confederation of British Industry (CBI) and Association of Colleges (AoC). The guidance published on April 21, which had been promised in last month’s budget, also revealed the levy system due for introduction in April 2017 would not be fully operational until 2020. And a confirmation that 98 per cent of employers would pay mandatory cash fees, caused Association of Employment and Learning Providers chief executive Mark Dawe to warn the government needed “to think very carefully” about its impact on smaller employers. Neil Carberry, CBI director for Employment and Skills, thought the guidance showed the government was “now engaging with employers”. AoC chief executive Martin Doel agreed, telling FE Week there was “still much that needs to be clarified”. The operating model also warned that the Digital Apprenticeship System would not be fully operational for all small employers until 2020. Mr Dawe responded: “If delay means that the system will work, we would rather have that. And David Hughes, who used to be responsible for funding and contracting of all apprenticeship programmes at the Skills Funding Agency and now leads the Learning and Work Institute, agreed. But Shadow Skills Minister Gordon Marsden warned “even a three year phased launch sounds ambitious to say the least”. The levy, first announced by the government in July, is set at 0.5 per cent of an employer’s paybill. As outlined in the new guidance, all employers will receive a £15,000 allowance to offset against the levy. This means only businesses with a paybill of more than £3m will pay. The money raised will be ring-fenced, so it can only be spent on training apprentices and all levy-paying companies will receive a 10 per cent top up on monthly levy contributions. The new guidance promised further information in June, for example on the provisional level of government support for non-levy payers’ training costs. It added “full, draft funding and eligibility rules” would be published in October, with “final detailed funding and eligibility rules” and guidance on “how to calculate and pay” the levy due in December. 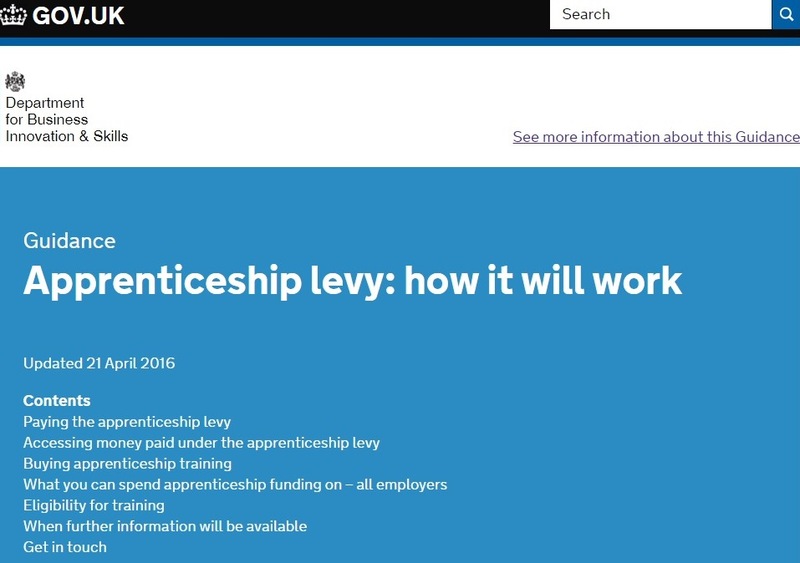 The latest apprenticeship levy operational guidance is almost totally geared at explaining how it will work for the employers forced to pay it. This is welcome, although 5,000 words on a single government web page seems a little rushed and half-hearted. But colleges and independent training providers remain largely in the dark about how it will affect their funding from April next year. There is promise of ‘provisional’ detail next month, but this is a poor state of affairs when you consider the change kicks in for all new apprenticeship starts four months before the end of the 2016/17 academic year. Despite the admission there will be a phased implementation it strikes me that everyone, civil servants included, will wonder whether switching to the levy from April 2017 is over ambitious. Few large scale government IT projects involving multiple departments start with a national roll-out, for good reason. That is a (very) long web page! Non-levy paying ‘co-investment’ outline model looks weak – is there evidence to support demand from those smaller employers if they only have to pay a contribution if they engage? They may simply choose to opt out – current volumes of Apprenticeships (c.50%) relies on these employers. It feels like there is too much to be built and rolled out in the timeframe available. Obviously we don’t have line of sight of a detailed project schedule setting out each of the work packages and activities and their dependencies to each other, but experience tells me this is a tall order. Some visual illustration through Business Process Modelling could be a good idea for the next update – quite a lot of text to follow for a process with this update. The larger employers we are engaged with are disappointed that there is very little ‘operational’ detail in the announcement and that there are still some major principles to be resolved such as supply chain involvement and ATAs. WE all know the Government will be able to collect the Tax. The question is will employers be able to reclaim their training and assessment costs? People are concerned that ‘in theory’ there is only 8 months left before employers can start to set up their accounts in the new Digital Apprenticeship Service’s (DAS) new IT system and only 11 months until the Levy has to be paid. They need time to organise themselves and they cannot do this until there is more detail available from the Government. Employers are starting to think, that with rumoured slippage on the DAS IT system, come the autumn the Government will have to announce that they are putting back implementation of the system for employers to reclaim training and assessment costs. On a positive, those involved with SMEs are welcoming the fact that the Government is staging the implementation and that SMEs will have more transitional time on the existing SASE apprenticeship framework.